Time to Winterize is fast approaching. Ask about our Winterization Packages on your next service appointment. Don't let your RV go without attention, ensure your investment is maintained. Each year, your RV requires two major service appointments.. in the spring and then again in the fall. Our climate is fast changing and harsh on RVs, it will cause deterioration. It's very important to keep on top of regular maintenance when it comes to the RVs. See our Winterization Package breakdown below. Drain fresh water holding tank. Drain water heater holding tank. Drain low point water lines. Add antifreeze (up to 2 gallons) through water lines. Add antifreeze to sink drains. Add antifreeze to water pump & toilet(s). 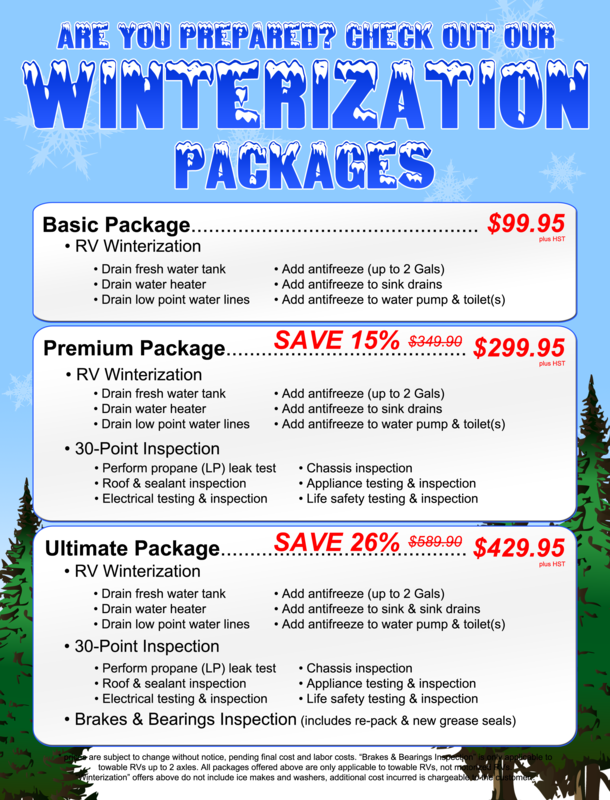 See Basic Package for RV Winterization inclusions. Perform propane (LP) leak test. Roof & Body Sealant Inspection. Life safety testing and inspection. See Premium Package for 30-Point Inspection inclusions. Remove wheels and hub assembly. Re-pack bearings with NEW grease seal.